Email is one of the industrial marketer’s top marketing tactics. Most companies have a reliable house list and many publish a regular e-newsletter. But there’s also email fatigue setting in among your audience. Everyone’s inbox is overflowing. Inboxes are overflowing with emails that are irrelevant to their recipients, and unrelated to their interests and needs. Often, recipients delete emails without opening them. Despite these challenges, email marketing can be cost effective and produce positive results in terms of reach, opens, clicks and conversions. In fact, according to “2019 Smart Marketing for Engineers”, a report published by IEEE GlobalSpec and TREW Marketing, 89 percent of engineers said the email/e-newsletters they subscribe to are valuable sources of information on the latest engineering technologies, industry trends, products or services. Forty-three percent of engineers subscribe to 2-3 e-newsletters, while another 43 percent subscribe to four or more. However, engineers are a busy and discerning audience. They won’t tolerate poor email practices on your part. When faced with their email inbox, 50 percent of engineers scan for subject lines that intrigue them and delete the rest. Without a subject line that gets their interest, your email might never get opened. Thirty-seven percent open most or all emails to scan for content or to read every one. Every marketer that publishes their own emails understands it takes effort and resources to manage their subscriber list, including adhering to strict General Data Protection Regulations (GDPR) for any subscribers who reside in the European Union. You also need production resources, which may involve content developers, graphic designers, and others. Faced with these challenges, its easy to see why not all emails are successful. The publisher handles all list management. This includes cleansing addresses, managing unsubscribes, adding new subscribers to the list, and adhering with all antispam laws and GDPR regulations. The audience consists of only opt-in subscribers who have requested to receive the e-newsletter and are likely to expect, recognize and open the e-newsletter when it arrives in their inbox. As a marketer, you can connect with hard-to-reach members of your target audience who are not on your own house list, yet would still be interested in your content, products and services. Your required production resources are much less. Often, you need only provide an image and a few lines of copy and the publisher will design your ad for you. The publisher provides comprehensive and timely reports demonstrating the performance of your e-newsletter ad, such as number delivered, opens, clicks and forwards. The right media partner will be able to help you integrate your e-newsletter ads with other marketing programs, resulting in an approach that makes best use of your marketing resources. With the right partner on your side, e-newsletter advertising works. Is it time to add this program to your marketing mix? IEEE GlobalSpec offers 70+ newsletter titles that focus on specific industry segments and products. These e-newsletters target the very professionals you want to reach via their inboxes, giving you access to a highly engaged audience of decision makers who use e-newsletters as a key resource during all stages of their buying process. Find out more about e-newsletter advertising here. Industrial marketers sometimes overlook branding efforts in favor of programs that deliver easily measurable results such as clicks, conversions and engagement opportunities. But the fact is that branding is a powerful and necessary marketing strategy. Without a strong brand to influence your audience, those other more measurable programs may not work. Research has shown that engineers and other B2B buyers are not simply rationally-minded decision makers. Emotions also play a role in B2B purchasing decisions. Customers feel better buying from a company that they recognize and respect; in other words, from a brand that makes them comfortable and confident in their decision. You’ve heard the expression, “No one has ever gotten fired for buying IBM.” That might be the most effective brand statement in history. What it means is that buying from IBM is the right choice because its brand is reputable and safe. Many companies who might have offered better products and feature sets lost business to IBM simply because of IBM’s brand strength. A strong brand mitigates the perception of risk and alleviates some of the fear that buyers inevitably experience when facing a purchase decision. Effective branding puts a stake in the ground that says to potential customers: “This is who we are, this is what we do, and this is why we do it.” Your customers will buy more confidently because they know what your brand stands for. Business is all about relationships, even when the products offered for sale might be perceived as commodity components. And relationships are based on trust. Without trust, there is no transaction. If a potential customer trusts your brand, he or she is more likely to buy from you. Many industrial companies have customers they have supplied for years. These are your loyal customers. Very few industrial buyers will change their supplier if an unknown company comes calling with an offer of similar products for 10 percent less. If you show that your brand is worth trusting, customers won’t be tempted to make a change to a competitor. For the majority of engineers, nearly 60 percent of the buying process happens online before they speak to a vendor, according the survey “2019 Smart Marketing for Engineers,” published by IEEE GlobalSpec and TREW Marketing. If you don’t have a strong brand presence, you might never be found by potential customers in the early stages of their buying process, and you won’t be in the game when it’s time for engineers to make a purchase decision. If your brand is known and recognized in your market, your sales people can save a lot of time by not having to explain what your company is about and why a prospect should buy from you. With an unknown brand, sales people are starting at the bottom rung with every sales opportunity. They have to work to convince prospects that your company and products are worthy. Branding should be an integral part of your marketing strategy, if it isn’t already. Fortunately, branding tactics don’t have to work in isolation; they can also help to generate engagement opportunities with your target audience. Have a stellar company website. Not just a website—an exemplary one. Easy to navigate, fresh content designed for your target audience, and landing pages and conversion forms to capture leads. For most engineers (89 percent), a company’s website has an impact on their perceptions of them as a credible, technically competent vendor (Smart Marketing for Engineers). Produce content. Ninety percent of engineers are more likely to do business with companies that produce new and current content. Your ability to continually educate and meet the informational needs of your audience during their buying process is one of the most effective ways to bolster your brand’s reputation. Use display advertising. Display ads on industrial websites offer broad brand exposure to your target audience, helping to increase visibility and awareness. Ads can serve two purposes—branding and engagement—by driving users to landing pages containing offers and conversion forms. Show up in an engineer’s inbox. Placing advertisements in targeted, industrial e-newsletters can get your brand into the inbox of motivated engineers and industrial professionals. Keep up a social media presence. Don’t ignore social media just because it’s not a big lead generator. Social media is an effective way to keep your brand visible to your customers and the market. Use social media to distribute content, participate in conversations, and reinforce your position as a market player. Exhibit at tradeshows. While tradeshow attendance has been declining in recent years, exhibiting at select events is still a good way to increase visibility to a targeted audience and to show your audience the people behind your brand. Choose your tradeshows carefully, as they require investment and planning. Has Your Marketing Reached its Expiration Date? Like fresh produce, meat or seafood, marketing programs have an expiration date after which they become stale or spoiled. For instance, ad fatigue can set in among an audience that has seen the same creative over and over. No marketing campaign is designed to run indefinitely. While the marketing channels you use will likely remain relevant, the creative itself—content, imagery, messaging, calls-to-action—has a much shorter shelf life. Declining metrics. Results are the most important signal that you need to make a change. If metrics such as click-throughs, page views, conversions, shares, engagement opportunities or other key performance indicators are showing sagging performance, your creative has likely run its course. New offerings. When your company comes out with a new product or service, it’s definitely time to update your creative to promote the latest offerings. New strategy. Companies shift gears all the time. What was important last quarter might be on the back burner this one, with new priorities coming to the forefront. You need to adjust campaigns and creative to reflect these changes. New customer needs. If your product marketing teams identify new customer needs that can be met by your products or services, you’ll want to update your advertising to take advantage of the situation. Timing-sensitive offers. If you’re advertising an event or tradeshow, make sure to swap out creative as soon as the event ends. Similarly, offers with deadlines should be removed as soon as the deadline passes. Poorly timed advertising is not making the best use of your media buys. Any one of the above signs could indicate the need for you to perform a complete overhaul of your creative and messaging. However, making smaller tweaks to creative or campaigns can often extend the life of your marketing programs and keep them performing well. Update the headline in an advertisement to focus on a different benefit. This is a relatively minor but often highly successful tweak that can add freshness when products offer more than one significant customer benefit. You’ve already reached everyone you can touting the first benefit. Now extend your reach by extolling another benefit. Replace imagery. You don’t want to start messing with your logo or company brand, but if you’re using stock photography or illustration, swap in something new. If you’re using product photos, show the product from a different angle, in a different setting, or in a different image style. Changing typeface and colors is also an easy way to give creative a fresh look and feel. Change the offer. Maybe you’ve had a white paper offer whose performance has trailed off in terms of conversions. That means it’s time for a new content offer, but you may not have to start from scratch. If the white paper is still relevant in its content and messaging, try re-purposing it into a webinar and change your creative to promote it. Advertise in a different e-newsletter. Media partners such as IEEE GlobalSpec offer dozens of targeted e-newsletters. If you’ve been focusing your media buy on only one e-newsletter, experiment with another, closely-related publication that also reaches your target audience. In this case, you might not be changing your creative, but slightly adjusting your media buy. Exhibit at a different event. If you’ve been attending the same tradeshows year after year, look for a new event where your message can resonate and you can connect with your target audience. There might be boutique events that are targeted but very worthwhile. If your tradeshows are your tradeshows no matter what, come up with a new theme to promote when you exhibit. To get the most out of your media buys, you not only have to choose the right channels to reach your audience, you also have to adjust your creative strategies to keep your message fresh and relevant and to capture your audience’s interest. More and more, marketers are being tasked with proving the return on investment (ROI) of their marketing initiatives. This can pose a challenge, because there are many ways to determine the results and value of each campaign. For our most recent Marketing Maven survey, we wanted to know more about how industrial marketers handle proving ROI and what challenges they encounter. 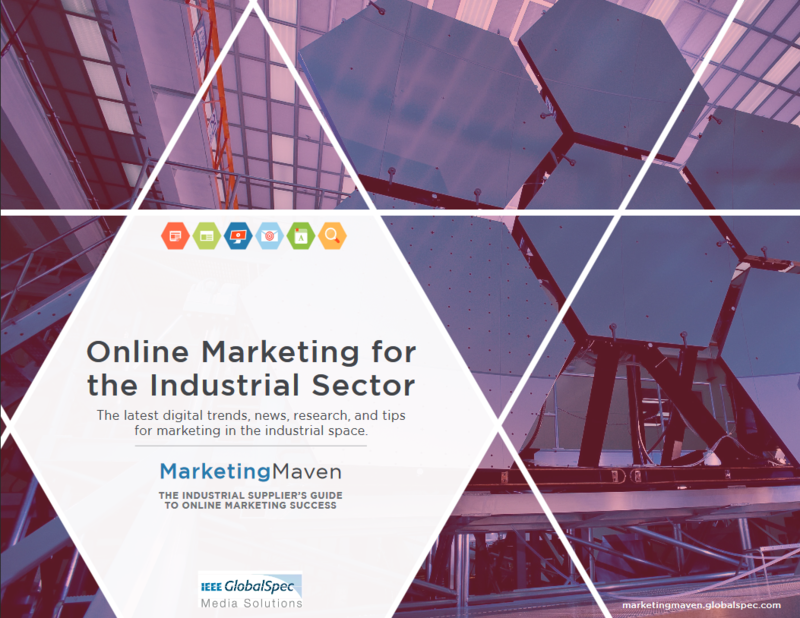 For our most recent Marketing Maven survey, we wanted to know more about how industrial marketers handle proving ROI and what challenges they encounter. First, we asked them for which marketing channels they measure ROI. Traffic to the company website was the most popular answer, with 62 percent of respondents measuring ROI. Other popular answers are email marketing and tradeshows. 12 percent of respondents don’t measure ROI at all. Only 22 percent track ROI on webinars, 19 percent track e-newsletter advertising, and 17 percent track display advertising. Industrial marketers that measure metrics focus on clicks first and foremost, with 60% reporting that they look at that metric when comparing the performance of their media spend and making purchasing decisions. Engagement rate (CTR) was the next most popular metric, followed by cost per click and cost per lead. Acquisition channels and cost per sale were the least commonly tracked metrics. The majority of industrial marketers (53 percent) run campaign performance reports monthly. 19 percent choose to run them quarterly, and 10 percent check every week. Two thirds of respondents don’t have an outside partner that handles any part of their reporting and tracking. When it comes to challenges in reporting, industrial marketers report a variety of issues. 24 percent of industrial marketers say their greatest struggle is that their data is too siloed. 21 percent have trouble showing ROI for their investments/marketing programs. 12 percent aren’t sure which factors to pay attention to. over half of marketers track. Additionally, ROI might not be top of mind for all marketers, who tend to run reports monthly. We understand that marketers today wear many hats, and tracking analytics can be overwhelming and easy to put on the back burner. However, tracking the ROI of your marketing programs will only lead to more successful and efficient portfolio of campaigns. Consider transitioning some of your programs to a media partner that can help you track and interpret their results. Increasing your company’s visibility in the marketplace is essential to capture the attention of your target audience. High visibility equates to high brand awareness, and potential customers want to do business with brands they recognize and trust. Additionally, high visibility helps your company get discovered by engineers and other technical professionals in the early stages of their buying process. Because engineers prefer to search and research independently and wait to contact vendors, you must be seen early and often in the marketplace to have a chance at the sale. Reach—are you using marketing programs that allow you to be discovered by your target audience? Frequency—are you maintaining a regular presence on your marketing channels? Timing—are you reaching your target audience when they are actively searching for products and solutions? E-newsletters—Advertisements in industry-focused e-newsletters can extend your reach to new markets, build brand awareness and drive qualified traffic to your website. Social media—Regular updates on social media channels that your target audience prefers (LinkedIn, Facebook) help keep you front and center with engineers. Relevant posts can be easily shared by users, helping to further increase your reach. Display advertising—Used on a network of targeted industrial sites, display ads offer high visibility and brand awareness. Industry-specific websites—Directory listings, content hubs and online catalogs offer you an opportunity to level the playing field with companies of every size and reach potential customers during their search process. Media relations—Public relations efforts such as pitching stories, writing by-lined articles, providing expert opinions on newsworthy topics, and sending press releases can increase the number of mentions your company receives. Webinars—Whether hosted by your company or with an industry partner, webinars are powerful branding opportunities that deliver a captive audience. Tradeshows—Still an effective way to increase visibility – choose the one or two events that are most important to your company. Video—One of the fastest growing marketing tactics for manufacturers, watching video is soaring in popularity among engineering and technical professionals. All the above-listed marketing programs can help increase your visibility. The challenge is to track the relevant metrics so that you can measure performance. The most important factor about metrics is not what they reveal in a single snapshot of time, but trends over time. If your results increase month over month and quarter over quarter, you’ll know that your visibility is increasing as well. Another point to keep in mind is that measuring visibility is a lot easier if you use technology. According to the Content Marketing Institute the top technologies that manufacturers use to help manage their efforts are social media publishing/analytics, email marketing software, and analytics tools. Website traffic: Measuring new vs. returning visitors gives a sense of visibility with a new audience. If the percentage of new visitors rises in relation to returning visitors, your visibility is increasing because new audiences are discovering you. Search volume of your brand name: How often users type your company name into search engines is a good measurement of brand awareness. On industry-specific websites, the number of visitors to your directory listing or content hub measures visibility; additionally, the number of click-throughs to your website measures engagement. Social media metrics such as the number of followers, shares and retweets all measure visibility. Shares and retweets, along with comments and likes, also measure engagement. The number of times a user sees your display ad or page, measured by impressions, is a simple metric that is easy to measure and provides a strong indication of visibility. Clicks on display ads measure engagement with your content. These metrics hold true for e-newsletter advertisements as well. Video metrics are available through video sharing platforms such as YouTube. Number of views measures visibility. Length of view and comments measure engagement. To measure the impact of media relation efforts, use the free service Google Alerts, which will notify you of specific keywords mentions such as your company name, product names or other relevant keywords in news articles, blog posts web pages. As some of the metrics above demonstrate, you can measure both visibility and engagement. Both are important. Visibility is exposure, but engagement goes one step further and indicates audience interest. To increase both factors, stay active with your marketing programs, produce and deliver content that is relevant to your audience, and make your content easy to share. Although manufacturers exhibit at fewer tradeshows now than in the past, and engineers attend fewer, tradeshows can still be a very effective marketing tactic if exhibitors tweak their marketing approach. For exhibitors, tradeshows offer visibility in a market, an opportunity to meet prospective buyers and a chance to keep tabs on competitors. In addition, according to a recent survey by TREW Marketing and IEEE GlobalSpec, 86 percent of engineers say that tradeshows are a somewhat or very valuable source for seeking information on the latest engineering technologies, industry trends and products or services. However, this is the digital age, and manufacturers must use digital tactics before, during and after tradeshows in order to achieve success and produce positive ROI from a traditional and often resource-intensive marketing program. Give prospects a reason to seek you out at a tradeshow by building excitement about your presence. Create show-specific display ads to run on industrial sites. This will make your brand highly visible and give potential attendees a reason to visit your exhibit. Use advertisements in targeted industrial e-newsletters to announce the tradeshow. This is great way to connect with a hard-to-reach audience that is not part of your house list yet may be interested in meeting you. Email your internal list on multiple occasions leading up to the tradeshow, giving prospects an opportunity to register and make travel plans. Reach out via email to individual customers/prospects, bloggers, influencers and media professionals. Try to set up one-on-one meetings at the tradeshow with the most important people. Announce your upcoming tradeshow presence on your website. Include a form for those who’d like to request a meeting. Post to all of your social media accounts that you will be exhibiting at the tradeshow. Promote the benefits of attending and give your audience reasons to stop by your booth, such as hands-on opportunities with your products or a special presentation. Tradeshows used to be places where prospects collected brochures and other content. Now all of that information is available online on your website. Today, tradeshows are all about engagement and building community. Make sure all of your booth staff are trained regarding your goals for the show. Use digital data capture capabilities on site for gathering prospect information for post-show follow-up. Continuously run a video in your exhibit space. This doesn’t have to be a one-time-use video. You can also post the video on your website and link to it from emails and social media to get extra return on your investment. Take digital photos—lots of them—and identify the people in each shot. A great follow-up after the show is to send your prospect of photo of themselves with people from your team. Use social media during the show to post updates and share the experience. Shows will often have their own hashtag to use. Make sure you have a comfortable space to conduct face-to-face meetings, either within your exhibit area or in a convenient space nearby. Don’t make the mistake of thinking your marketing efforts are over when the tradeshow ends. Often, your marketing is just getting into gear. Quickly follow-up via email with everyone you met at the show to say thank you for visiting your booth. Offer links to exclusive content related to the show, including educational information such as white papers and articles as well as fun stuff such as event photos and videos. Segment or score your attendee list into prospects who deserve immediate attention you’re your sales team and those who belong in your lead nurturing program. That video you premiered at the tradeshow? Make sure it’s posted on your website and other platforms where prospects can view it. Follow-up with any contacts you made with media professionals, bloggers or other influencers. Remind them of what you spoke about. Try to make appointments with those you’ve missed so you can pitch your story. Despite the time, resources and person-power required to exhibit, tradeshows can still be an effective marketing program. Just make sure to integrate your efforts with digital market at all phases: pre-show, on-site and post-show. This year, Maven readers got down to brass tacks. You were focused on learning new skills like SEO, as well as improving your strategies, like measuring and proving the ROI of your marketing programs. As always, you’re focused on your plans and programs, even tweaking them throughout the year. If you read the Maven regularly, you’ll know that we’re committed to leaving no stone unturned in the marketing world — from SEO to content creation to programmatic advertising and more. If you missed any of our most popular articles, now’s the time to take them in. Even our most loyal readers will find them valuable on a second read. In the coming year, we look forward to offering you more marketing insights and expertise. All of us at the Marketing Maven wish you the best both personally and professionally in 2019. There are some basic SEO tactics that almost every industrial company should deploy to help improve their rankings. Let’s look at each one of these in turn and how they can help improve your SEO rankings. To improve your ability to measure ROI—and to gain the insight you need to make meaningful adjustments to your marketing programs—follow these tips. Whatever point you’re at in your 2018 marketing planning, the “2018 Industrial Marketing Planning Kit” can help. This guide offers advice, tools and tips to efficiently target your audience of engineers and technical professionals and get the most out of your marketing efforts.